Oat Hill / Table Rock / Palasades. 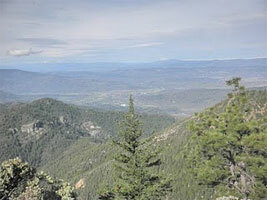 My favorite hike is to Table Rock for a little R&R, Picnic and Vino! Hiking Reminders and Etiquette: Be respectful to the land, water, vegetation and property. Do not trespass on anyone's private property; do not harm property, trails and vegetation. I hope you enjoy the site. Keep on Hiking! A five-mile long trail in Robert Louis Stevenson State Park leads to the top of Mount St. Helena, but gives hikers the option of a two-mile round trip to the Stevenson Memorial before it continues up to the summit over fairly rugged terrain. The climb through oak, madrone, California bay and knobcone pine ultimately yields one of the best views of Napa Valley and, on a clear day, of the Sierra Nevada range and the San Francisco Bay. The trail description at www.parks.ca.gov confirms that winter is the best season to experience this breathtaking view, but expect to experience a bit of a chill as well. 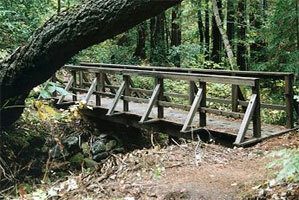 The trailhead, on Highway 29, is north of Calistoga, 8.2 miles from the junction with Highway 128. The old Oat Hill Mine wagon road starts at the edge of Calistoga and climbs for 4.8 miles, through a geological and biological smorgasbord, before descending to Aetna Springs. 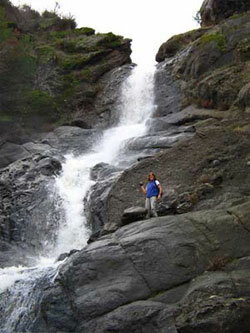 Hikers will find a moderate climb with spectacular views of the valley, Palisades, and Sugarloaf mountain. 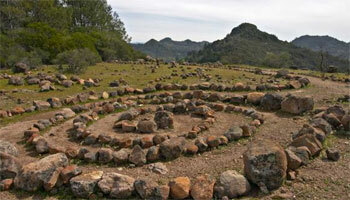 To hike all the way to Aetna Springs, a second car is recommended to shuttle back to Calistoga. However, this trail has enough to offer - alternating thick forest canopy with wide vistas of grasslands, vineyards and chaparral all the way up to the Palisades and beyond - to make even a partial trek worthwhile. Another option is to continue on the Palisades Trail to Table Rock and Highway 29, where it's also useful to have a second car for transport back to the crossroads of Highway 29 and Silverado Trail. 50 Campsites, plus RV Camping. Please call MISTIX at 1(800) 444-PARK to make reservations! 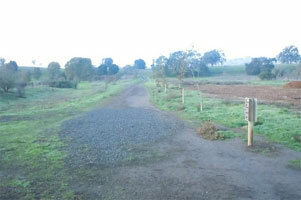 Horseback Riding available at this facility, call Napa Valley Trail Rides at (707) 996-8566. Five miles north of St. Helena, off Highway 29, several trails wend through coastal redwoods, Douglas fir, and madrone, from Ritchey Canyon to Coyote Peak. 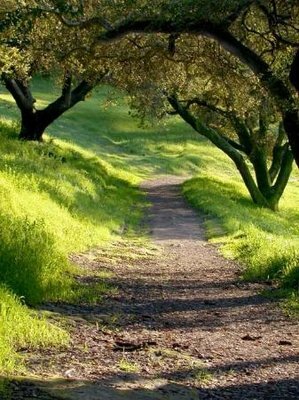 This park, near the northwestern corner of Napa Valley, tends to have more rain than the eastern regions of the county - all the better to bask in the rich riparian woodland and evergreen forest, and to inhale the enchanting aroma of California bay laurel in the wet season. For information on the 8.5 miles of trails in the park, visit www.parks.ca.gov. 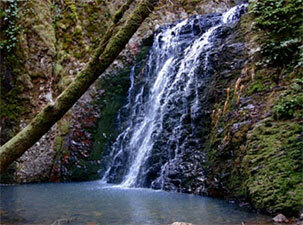 Devils Punchbowl Falls is a very scenic little 14 ft. high waterfall dropping into a gorgeous little gorge and pool. I had received an email from the facilities manager of St. Helena hospital which owns the property that the trail to the falls are located on. The property owner clearly states the property is private and trespassers will be prosecuted. Upon request, I have removed the street address and trail descriptions. The trail along Zim Zim Creek provided nice, easy hiking, but be prepared to wade across the creek many times. 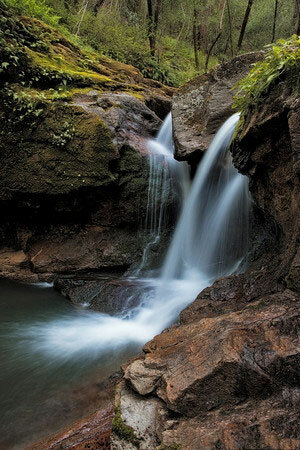 Depending upon the flow in the creek it may be possible to keep your feet dry if your hiking boots are waterproof. Alternatively you may want to go barefoot across the creek or wear shoes that you don't mind getting totally wet. Summer is not hiking season, but in the mornings, or if the weather is clement, there are trails to be hiked. Directions: take Silverado Trail to CA-121 N/Monticello Rd, turn left at CA-128 W/Capell Valley Rd, turn right at Berryessa Knoxville Rd/Knoxville Rd, slight left, turn right, turn right. Smittle Creek Trail: This is a 2.6 mile easy trail along the shoreline between Smittle Creek Park and Oak Shores Park. 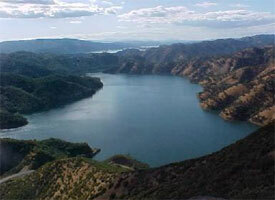 North End Trail: This especially scenic trail winds along the north shore of Lake Berryessa. The trail is an easy one with limited elevation gain and wonderful views down the full length of the lake, some 10 miles away, and to the Blue Ridge to the east. 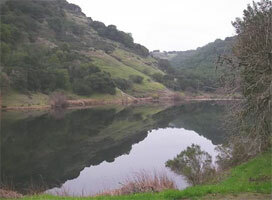 Pope Canyon Trail: This scenic trail follows the original Pope Canyon Road roadbed for about one and a half miles until the roadbed disappears into the lake. Segments of the Blue Ridge Loop Trail: The full hike is a 4 mile loop hike up Cold Canyon, and then a climb up to and return along the Blue Ridge. This is a very strenuous hike. 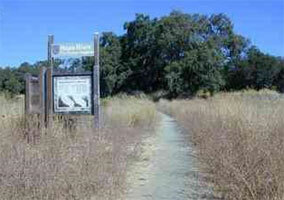 The Homestead Trail: This trail is on land that is part of the UC Davis Natural Reserve System, one of the few such reserves that allows public access. NO DOGS are allowed on this trail to protect the creek, plants, wildlife, and ongoing research projects. Up to Blue Ridge: This is a strenuous switchback trail from Cold Canyon up to the top of Blue Ridge. Rules: Open sunrise to sunset. Single trail is hiking only. Dogs are permitted on leash. Directions: Take Trower Avenue west from Highway 29 to Dry Creek Road. The 380 acre Archer - Taylor Preserve contains some of the oldest & largest stands of redwoods in the Napa County and the habitats range from redwood riparian to grassy meadows. It is the result of the extraordinary and exemplary generosity and foresight of the Taylor family. Preserve, located in Napa county, once owned by Taylor family, now is a protected area maintained by a non-profit organization Napa Land Trust. The trust organizes several hikes in this preserve every year. Rules: No Entrance Fees, No Dogs or Bikes. Rimrock Trail: Best views in the park. Return via Lake Marie Road, or for the “Superloop” via Skyline Trail. 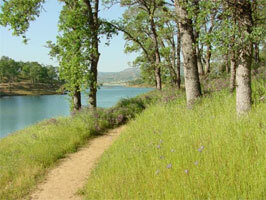 Location: City of Napa - The entrance to the park is from McKenzie Drive just off the Silverado Trail. There is a gate to the park that leads to the parking area that has 8 parking spaces. Dogs are allowed currently on leash per our municipal code. Hours: The park and parking area are open at sunrise and closed at sunset each day. Distance: 12.7 acres of green in the oxbow of the Napa River across the river from Copia. Directions: From St. Helena take Pope Street, Howell Mountain and Conn Valley Road to the Lake. 66478.2. The Legislature finds and declares that the public natural resources of this state are limited in quantity and that the population of this state has grown at a rapid rate and will continue to do so, thus increasing the need for utilization of public natural resources. The increase in population has also increased demand for private property adjacent to public natural resources through real estate subdivision developments which resulted in diminishing public access to public natural resources. 66478.3. The Legislature further finds and declares that it is essential to the health and well-being of all citizens of this state that public access to public natural resources be increased. 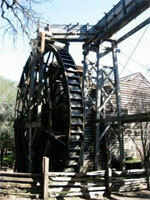 It is the intent of the Legislature to increase public access to public natural resources. (a) Does not lie within or run through cultivated land lying within the county. (b) Is stocked or supplied in whole or in part with fish by the state or counties. (c) Has not been declared by law to be navigable and in fact is not navigable for commercial purposes. From the time the ordinance becomes effective, the slough, river, or stream is a public highway for such purpose, subject only to the reservations contained in this article. 25661. If any owner of land adjacent to or across which the slough, river, or stream declared to be a highway for fishing flows does not consent to its use for such purpose with the right to pass along the banks for the purpose of fishing and on application refuses to grant the right of passage to the county by suitable instrument in writing, the board may contract for and purchase any such rights. 25662. If the right of passage cannot be purchased at a satisfactory price, the board may authorize condemnation proceedings to be commenced to procure the right.